Anne Chang-Godinich is an ophthalmologist working in the Cypress and Houston area. She earned her medical degree and completed her ophthalmology residency at Baylor College of Medicine in Houston. She was then selected fellowship training as a Heed Fellow in Cornea and Refractive Surgery at New England Eye Center at Tufts School of Medicine in Boston. Dr. Chang-Godinich offers complete eye care from routine exams to laser, Cataract with LenSx Laser (see to the left) and LASIK surgery. A few of the conditions she commonly treats include glaucoma, cataracts, refractive surgery, and diabetic eye problems. 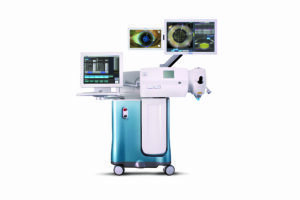 She uses state-of-the-art laser technology to aid in LASIK and cataract removals. In addition to her practice, Dr. Chang-Godinich is Clinical Associate Professor of Ophthalmology at the Veterans Affairs Medical Center, Baylor College of Medicine. She serves as a reviewer for the scientific journal, Ophthalmology and is listed as one of America’s Top Ophthalmologists by the Consumer’s Research Council of America. She has three beautiful children. Her interests are playing the violin, watching her kids’ sport events and traveling with her family.